For years I wanted to take a circular saw and cut the numerical pad off of my keyboard. The the last time I used it must have been…I don’t even remember. But there it sat, just taking up space and putting my mouse just beyond a comfortable reach. 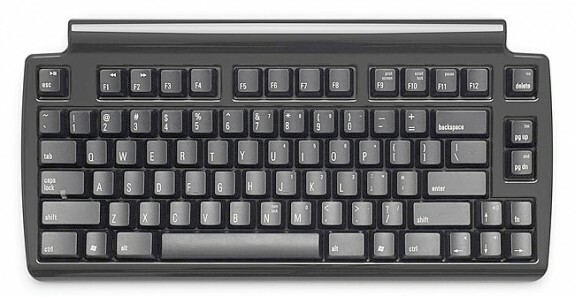 Fentek’s Mini Quiet Pro Computer Keyboard for PC is 13 inches wide by 6-1/2 inches deep and has 2 integrated USB ports. Then, one day, tucked away on the Web, I found two companies you’ve probably never heard of– Fentek and Matias. Fentek has the largest collection of specialized PC (and some Mac) keyboards in the world and Matias has its line for the Mac (and some PC). 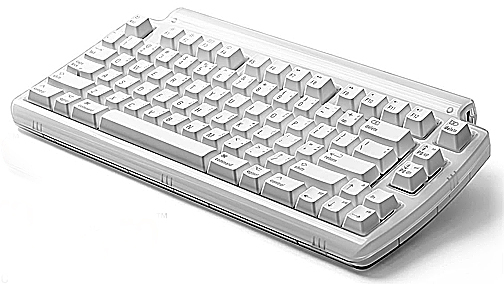 Fentek has scores of specialized keyboards to choose from. There are wireless keyboards, keyboards with integrated touch pads, and ones that are long, short and articulated. Take a look at their mini keyboard line, which has cool options like flexible foldables, illuminated keyboards, some with laptop or full-sized keys, a super mini, a mini thin, and an ultra slim, and one that’s called a Happy Hacking Mini Keyboard. You can also browse a line of ergonomic keyboards, various species of mice including those that are foot-controlled, vertical, gaming, and pen types. Then look at arm supports, a plethora of foreign language keyboards, and a keyboard line with large print on the keys. Matias Mini TactilePro for Mac gives a satisfying clicky-clack to keystrokes. It also comes in a “silent” version. About 13 inches wide by 6-1/2 deep with two USB ports integrated. How about a full-sized keyboard with a built-in color scanner, or a selection of keys with “Panic” printed on them that you can install on your keyboard just for fun? Each item has a full description with a large photo for easy comparisons. Matias started small some years ago and its clickty-clack mechanical Mac keyboard was a big hit. If you had a window open on a summer’s eve, all your neighbors could hear you “pounding” away, just as if you were at a typewriter. It let everyone know you were working hard –maybe even writing the Great American Novel– no doubt about it. As they grew into a larger company, though, Matias also developed keyboards that ran silent, ran deep and were whisper quiet. I finally opted for a Matias mini tactilepro that I can hit hard and hear the clicking (and so can everyone else in the house). Regardless of which type of keyboard tickles your fancy, the choices are mind-boggling at both Fentek and Matias and you’ll probably spend more time on those sites than you ever planned to. Keyboards without a ten-key section have become common-ish. Search for “keyboard TKL” or “keyboard tenkeyless” and a number will pop up. I just bought a TKL with mechanical switches for >$40. I have used Matias TactilePro keyboards in the past. Both failed about a year after I purchased them. Customer service was grudging to nonexistent. Perhaps Matias quality control has improved, but I suggest caution. I had one problem with an early Matias full-length keyboard about 6-7 years ago and it was replaced by them at the time without a hassle. These days a company has to stay on its toes because a bad product coupled with bad customer service can really affect its reputation and ultimately sales. So far, the keyboard is working fine and its quality seems to be right up there.